Exclusive VIP rooms. 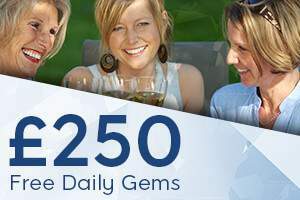 The Free Weekly Gems game was updated, details below. Tickets are free. Max 6 tickets per player per game. Shared game & jackpot prizes are split if there is more than 1 winner. Deposits can be withdrawn at any time. Withdrawal restrictions & Full T&Cs below. Start your Saturday night off right! Every weekend at 9pm we’re giving away £100 in cash and as one of our valued VIP’s you could be in for a win! This is a 90 Ball game that plays every Saturday at 9pm. £100 in cash prizes split as follows - FH: £50, 2L: £30 & 1L: £20. Players can receive a maximum of 6 tickets to each game. If you have a VIP account in any of our sister sites, you can also enjoy this offer there. Sister sites include: Wink Bingo, 888ladies, Posh Bingo, Tasty Bingo & Red Bus Bingo! Weekly Free Gems plays every Saturday at 9pm. Game type: 90 Ball. Tickets are free (max 6 per game). £100 weekly jackpot prize split as follows: FH: £50, 2L: £30, 1L: £20 in real money funds. This is a shared game. 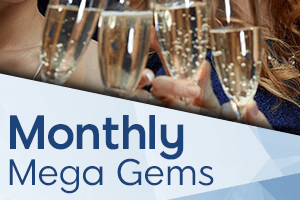 The Free Weekly Gems room is exclusive to VIP players only who deposit in the last 7 days and cannot be transferred. 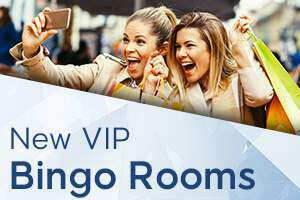 The offer is related to all VIP accounts, as acknowledged at the company data at websites Wink Bingo, 888ladies, Posh Bingo, Tasty Bingo & Red Bus Bingo. Withdrawing funds: Your deposit balance (defined as Transaction Balance under our Withdrawal Policy) is available for withdrawal at any time. General withdrawal terms apply. For further info see our Withdrawal Policy. Full bonus policy & Terms and conditions apply.